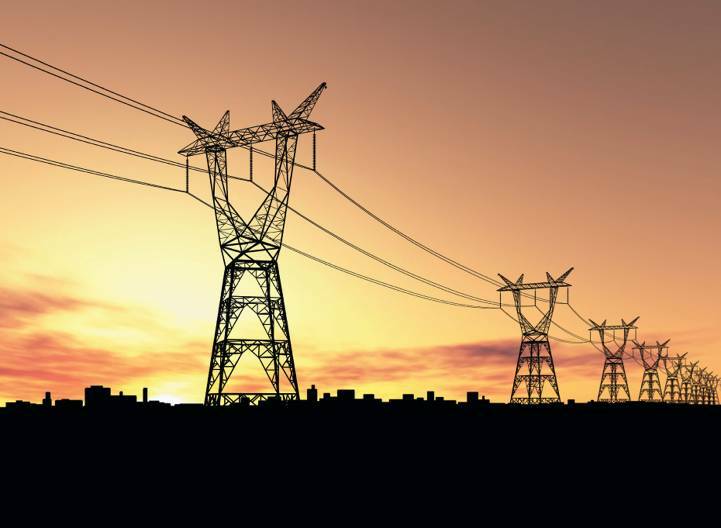 Transmission lines are used to transmit electrical energy over relatively long distances. There are three types of transmissions lines: overhead, underground and sub-transmission. Overhead transmission lines are used to transmit electrical energy in the form of three phases (3 AC. A basic transmission line system is represented in Figure 1. Transmission lines begin at the step-up transformer and end at the substation step down transformer, and typically span a distance of 300 miles or less. Figure 1: An overhead transmission and distribution system. Figure 2 will give you a good idea of the complex network of transmission lines that supplies power across the continental United States. 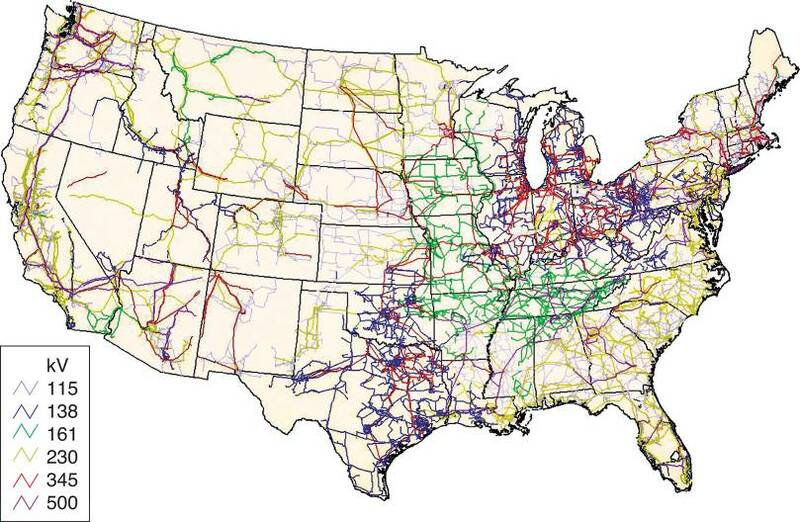 Figure 2: The U. S. power transmission grid. The most common transmission line voltages are 115kV, 138kV, 161kV, 230kV, 345kV, 500kV, and 765kV. Note that the voltages in the 365 kV to 765 kV range are sufficient to require extra transmission line precautions, such as increasing the distance between the lines to prevent Flashover (electrical arcing from one line to another). Transmission line towers like those represented in Figure 1 are identified by their size and shape. Two high voltage transmission line towers are shown in Figure 3. • It steps up (increases) voltage. • It steps down (decreases) current. For example, a generator step-up transformer that increases voltage by a factor of 100 decreases current by the same value. In this case, the power line loss is decreased by a factor of 1002 = 10,000. There is a limit, however, to how high the voltage can be increased to reduce I2R losses. At extremely high voltage—more than 2000kV between conductor and ground—Corona Discharge losses so high that they can offset the reduction in I2R losses. Note that power losses up to 5 percent of the total power transmitted along a transmission line are generally considered acceptable (though not desirable). Corona Discharge: Power loss along transmission lines that occur when high voltages ionize the air surrounding the power lines. As shown in Figure 1, overhead transmission lines end at substation step down transformers. These transformers reduce the transmitted voltage to the levels shown in Figure 1. The 26kV and 69kV lines shown in the figure are referred to as subtransmission lines. 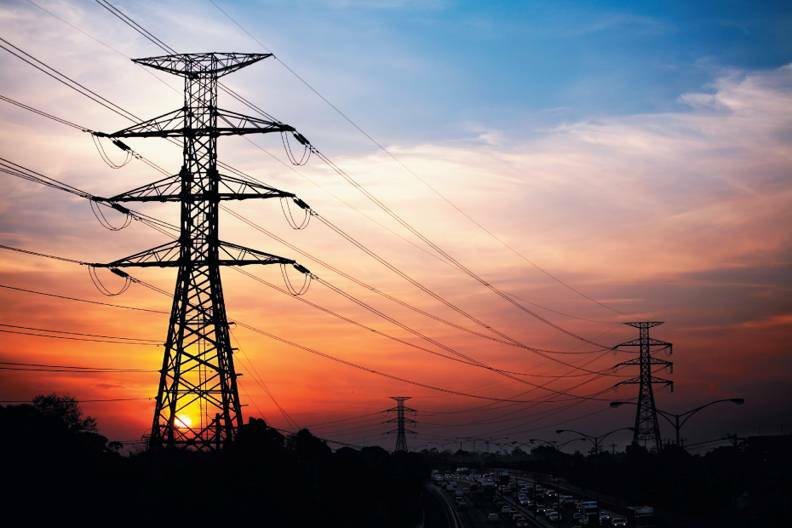 Subtransmission Lines carry voltages that are typically between 26kV and 69kV to regional distribution substations, that is, to substations that distribute power across a geographic region. Two subtransmission line towers are shown in Figure 4. Note that subtransmission lines may be tapped to provide power for local industries and substations. 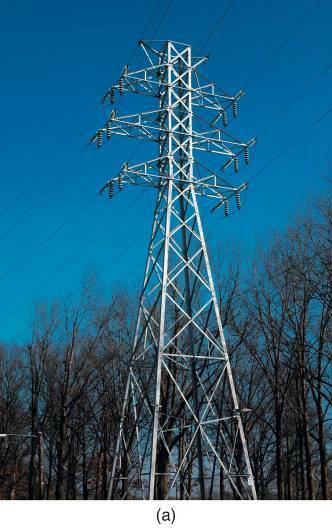 Figure 4: Subtransmission line towers. Underground transmission lines are used to transmit power through populated areas, underwater, and in other places where overhead transmission lines cannot be used. 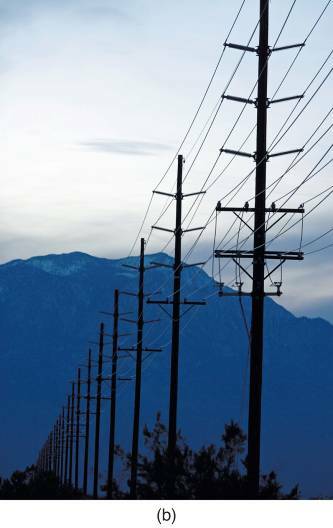 Unlike overhead lines, underground transmission lines are insulated to protect them from water and other contaminants. Underground transmission lines may be buried in trenches or conduit or may be installed in underground transmission tunnels. Underground transmission tunnels are cooled to increase the current capacity of the transmission lines they contain. Due to higher heat-related losses and higher costs of underground installations, overhead lines are far more common. There are several types of electrical substations, each connecting two or more elements in the power transmission system. A Step-up Substation connects the power generating plant to the transmission lines. A Step-down Substation is connected between transmission lines and subtransmission or distribution lines. A Distribution substation connects subtransmission lines to the distribution lines that serve local utility customers. An electrical power generating plans typically generate voltages between 2.3kV and 33kV. Step up substations contain high voltage transformers that boost the generator output voltage to a value between 115kV and 765kV, and provide power outputs in the thousands of kilovolt-amperes (kVA) and higher. The power required for the substation to operate is drawn from the substations’ input feed. Switching circuits are used to route power through the substation, allowing the operation to continue in the event of transformer failure or during required maintenance. A step up substation is shown in Figure 5. 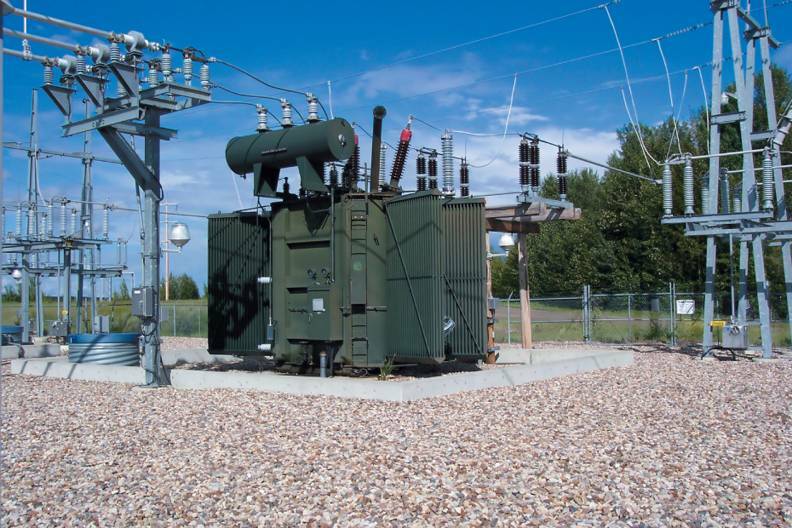 Figure 5: A step-up substation. As mentioned earlier, step down substations decrease transmission line voltages down to subtransmission line levels, typically between 26kV and 69kV. As such, these substations act as the interference between transmission lines and subtransmission lines. A step-down substation is shown in Figure 6. 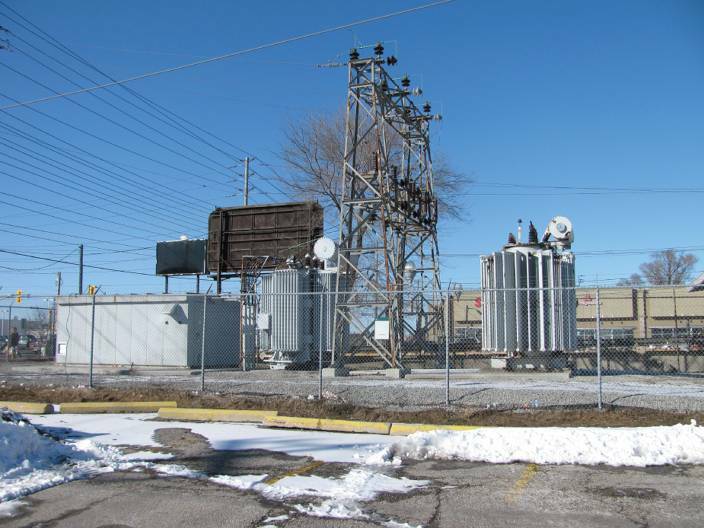 Distribution substations decrease subtransmission voltages to customer usable levels. As such, they are also step down substations. 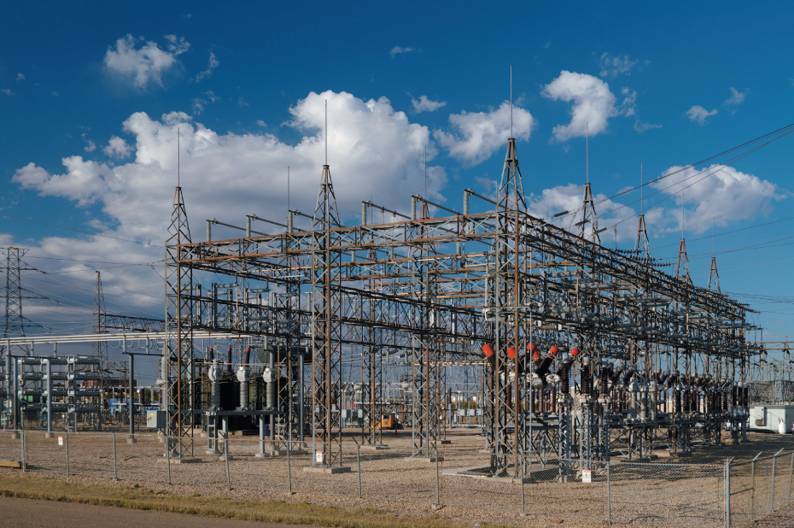 Like other substations, distribution substations typically contain lightning arresters, overload protectors (circuit breakers), voltage regulators, input and output switching circuits, and control circuits. A distribution substation is shown in Figure 7. Figure 7: A distribution substation. i) Overhead transmission lines transmit 3Φ AC power over long distances (300 miles or less) and at high voltages. Common voltage levels range from 115 kV to 765 kV. ii) Underground transmission lines are buried in trenches, in conduits, or in vaults, and often cooled. They are most often used in highly populated areas where overhead lines are impractical. iii) Subtransmission lines carry lower voltage power to distribution substations. Power is found as I2R and as E × I. If the voltage is increased, say by a factor of ten, then for the same power, current will be ten times lower. But for a given resistance, if current decreases by a factor of ten, the power lost from I2R losses decreases by a factor of 102 or 100 times. Subtransmission voltages are usually between 26 kV and 69 kV. i) A step-up substation connects the power plant to the transmission lines. ii) A step-down substation connects the transmission lines to sub-transmission or distribution lines. iii) A distribution substation connects subtransmission lines to the distribution lines.